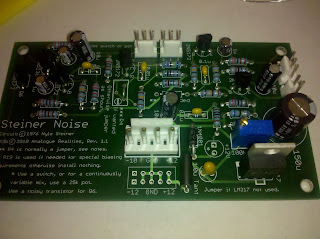 Here's the Noise PCB. It is pretty simple, both in parts & features. It is basically a white noise generator, with a filter for pink noise output, and an output attenuator. There's actually two possible front-panel configurations, as there's only a single output: one with a white/pink selector switch, and another with a pot for a continuous cross-fade between white & pink noise. I think I'll build this one with a switch; I plan to build at least one of each, though. There's one optional resistor, which I've omitted. And I've also omitted the trimpot, and replaced it with a jumper. Both of these can be seen in the pic & are described in the build docs (and PCB notes). I'm thinking that I possibly should've put a socket in for the reverse-biased NPN transistor which provides the white noise. I've never built a noise generator before, but I know that different individual transistors can provide different responses, and you sometimes have to choose the "right one". Hopefully, however, it won't be a problem and I'll get a good output from this board.